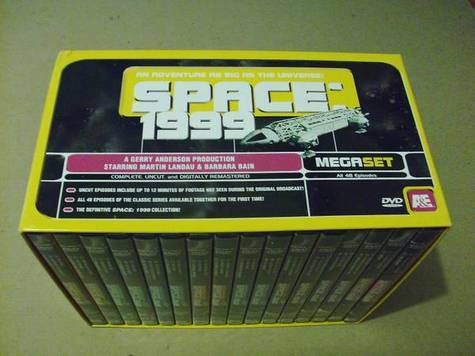 This Posting is for one copy of the British Sci-Fi Classic: Space:1999 Megaset in Excellent condition! If I did not inform you that this Item is not Brand new you might not even know. It has/contains all 48 episodes; each with additional footage (some as much as 12 minutes). It also has extras such as: Trailers for episodes, as well as behind the scenes footage & stills. If you have priced this Item New (such as Amazon), you already know it sells for some $200. Outside of the USA extra Shipping fees apply. Contact me with your Shipping information for shipping quotes. If desired I can/will add Shipping-insurance to this or any Item (extra fee).